For more than three years, Mike Wilson (aka Saw) has been serving up some of the best barbecue in Alabama. He smokes his meats slow and low over green hickory wood in a heavily charred brick pit. He begins this process when he gets up in the morning and continues it until he closes up for the day. 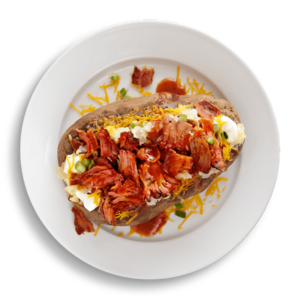 A town favorite, Saw’s Pork-Stuffed Tater is a large baked potato topped with green onions, bacon, pork and a hearty helping of the vinegar-based Saw’s Sauce. Wilson’s establishment is a true Southern barbecue joint, featuring blues music and walls covered in sports memorabilia, license plates and other local flair.